Spring is here and Easter time, too. There are still plenty of days left to come up with ideas to decorate your Easter table. In this issue we will try to help you out with a few ideas of our own to get you started. We will also introduce you to the latest herbal tea added to the website. It is a cleansing, digestive tea that may bring some relief to your stomach, liver and kidneys. With Easter just a little over two weeks away, it would be great fun to throw an Easter-themed tea party. So even if you don’t have a big Easter lunch, you can always gather a few friends and family around the table and share a pot of tea. 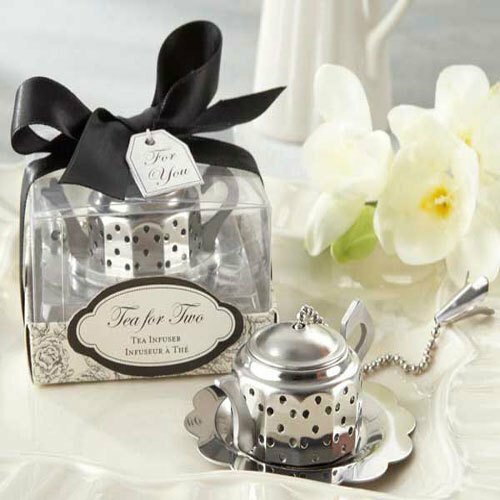 If you are having an Easter tea party, choosing the right tea is the first step. Spring is just around the corner and with a little luck, the cold weather of winter will soon be leaving. 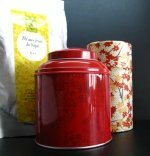 Let’s put away the black teas flavored with strong warm and zesty flavors, such as cinnamon and ginger. Celebrate the arrival of spring with green or white teas, plain or scented with fresher and floral aromas such as jasmine or rose. 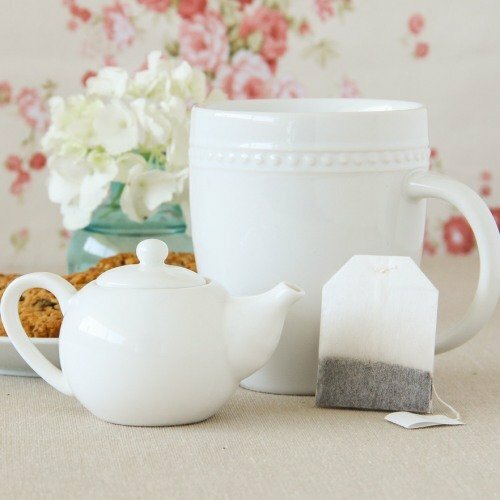 Extra: Cover your teapot with a tea cozy with floral patterns to add an even greater touch of spring. Any tea party has to have savory treats alongside the sweet ones. Add an Easter touch to the regular cucumber sandwiches of any tea party. 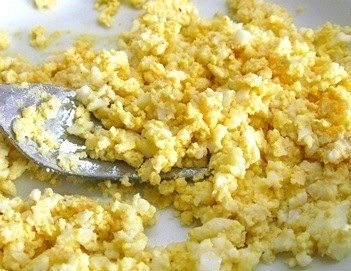 Boil a couple of eggs, peel them when cooled down and then crush them with a fork. Season to taste and add a knob of butter or vegetable cream just so to hold the mix together. 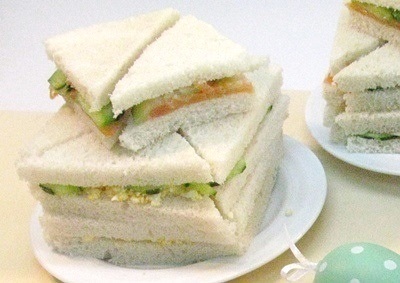 Make you sandwiches with thin cucumber slices and add a splash of yellow with the egg mix. In others you can also add smoked salmon, adding both a variety of flavors and colors. Extra: Cut your tea sandwiches using cookie cutters. 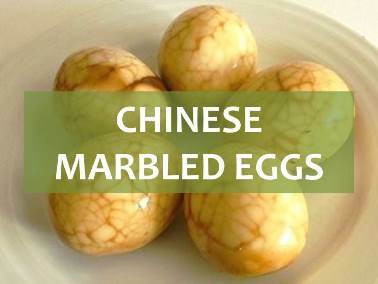 There are really cute ones shaped like rabbits or eggs. Sometimes when throwing a tea party we find that we don’t have enough tea cups in a single matching set for all the guests. Be bold and serve your tea in mismatched cups. You can choose cups that have similar patterns or colors that go with your decoration. Just don’t let the number of tea cups you have limit the number of people you invite! 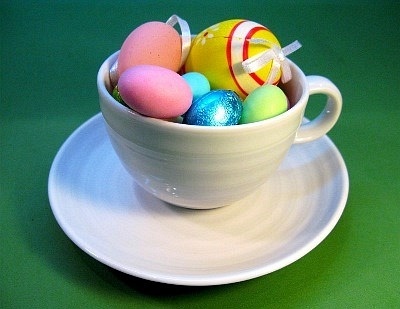 Extra: You can also place mismatched cups spread around your table filled with sugar-coated almonds or chocolate eggs. Let each cup hold a different surprise for your guests to find. Afternoon teas are usually served using tiered stands. Easter tea parties are not an exception. Savory Easter treats: egg sandwiches, egg tarts and deviled eggs. Sweet Easter treats: chocolate bunnies, sweet almonds, chocolate eggs. 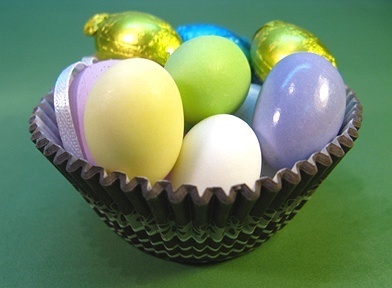 Extra: use colorful cupcake wrappers, filling each with a different type of almond or chocolate treat. 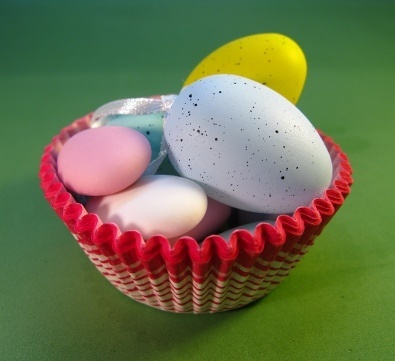 Try finding cupcake wrappers with typical Easter colors. Now that you have chosen your tea, made your sandwiches, filled cups and tea stands with all sorts of treats, it’s time to add the final touches to the table. Sometimes something as simple as a bit of colorful ribbon can set the mood and bring the whole table together. 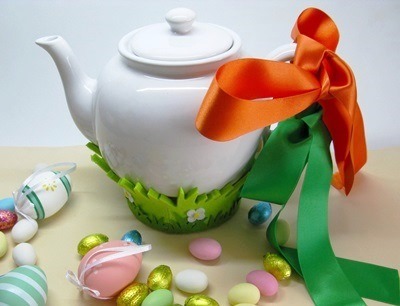 Add a touch of color by tying a bow to the handle of your teapot or to each person’s napkin and cup. Fill the room with flowers and display as much color as possible. We are all a bit tired of winter and need some cheering up! If you still need one final tip to feel inspired, why not try to serve tea flavored eggs? In last year’s Easter newsletter, we shared with you a recipe for tea flavored eggs. We hope you have found some inspiration and have fun trying some of these ideas. Easter is a great time to get together with the people you love, so why not make this day special? Boldo tea is a cleansing tea that serves to rid the body of toxins, microbes and bacteria that stress the body, helping to create barriers against disease. This is an herb from South America that has long been used to make an infusion to improve the health of your digestive tract and at the same time cleanse and strengthen the liver. 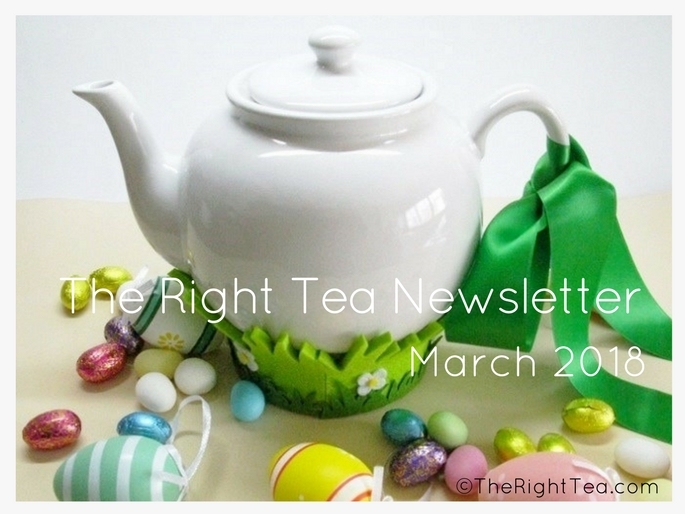 More information about tea is coming, so keep on the lookout for the April issue of our newsletter. While you wait, look around our website and learn more about tea and its health benefits.